Knitting a sweater is a lot of hard work, so naturally you want all of that work to pay off with a sweater that you’ll love and wear forever. However, this was not the case for beginning sweater knitters (and, let's face it, sometimes experienced sweater knitters have a few missteps!). In today's guest blog post, Johnny Vasquez of Yarn Nation shares his stories of woe and how he learned the hard way with his first few sweater projects so that you can avoid them, too! 1. You chose the wrong yarn. One of the very first sweaters I knit was a chunky, 100% wool pullover. It was so warm! Unfortunately, because it was so warm (and because I live in Southern California, where it is fairly warm all the time), I rarely wore it for fear of roasting. One day I decided to wear this sweater but it got so hot during the day that I needed to wash it when I took it off. Being new to the whole fiber scene I just threw it in the wash and forgot to take it out when I switched the wash over to dry. I'm sure you can guess what happened....it ended up being thick enough to stop bullets and too small for even a chihuahua! Needless to say, I chose the wrong yarn for my particular situation. Something more suitable would’ve been a lighter weight superwash yarn or perhaps a cotton blend that would be easier to care for. 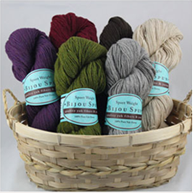 Here are some things to consider as you’re choosing yarn. Who will be wearing it? Do they live in a warm or cool climate? Will it need to be washable? Do you mind taking extra care to hand wash your sweater, or is an easier care fiber a better option? If you are knitting for a child that likes to play and often gets dirty, you’ll probably want something machine-washable. Where will it be worn? Is this sweater for your hike through the Andes or to wear over your party dress? 2. It doesn’t fit because you measured gauge incorrectly. I’ll be honest, for a good long while I didn’t even know you were supposed to measure gauge. I figured it was just a nice little piece of information they included at the top of the pattern. It turns out that getting the exact gauge called for by the pattern is integral to getting a sweater that fits and is proportioned correctly. When I finally began swatching before knitting I would just make a small swatch, leave it on the needles and make sure I was getting something close-ish to gauge, and then I would rip it out and jump right into knitting the sweater. I learned the hard way that getting close to gauge is not the same as “getting gauge”. Being off by even a fraction of a stitch per inch can make the difference of a precious few inches in your finished sweater. Take the time to make a large (5” x 5”) swatch in the stitch pattern that is called for and make sure to bind it off. Wash it and block it then use a ruler to measure your gauge. If your gauge is not exactly what is called for by your pattern, change your needle size and make another swatch. Repeat this process until you have perfect gauge. If you aren’t getting enough stitches per inch that means your stitches are too large, so try going down a needle size. If you are getting too many stitches per inch that means your stitches are too small, so try going up a needle size. 3. It doesn’t fit because you did not get proper body measurements before you started. Maybe you did everything else right, but you chose to knit the wrong size because you were unsure about your actual body measurements. If you take the time to get detailed body measurements beforehand, you will be more informed when it comes to choosing the size of sweater you want to knit. 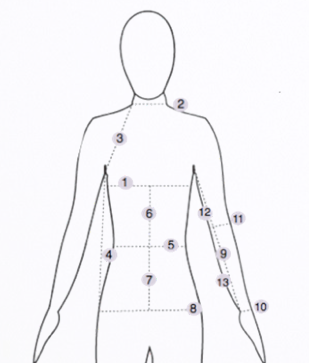 Be sure to check the pattern to see if the measurements listed are for your measurement or if they are the completed measurement of the garment. 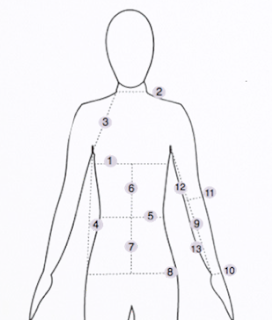 If they are the completed measurement of the garment, you will want it to be a few inches (2-4 for women, 3-6 for men) larger than your actual body in order to fit comfortably...but in order to do this, you have to know what your body size is first! Grab a friend and take a few minutes to get your body measurements (you can download this free sweater planning guide for detailed instructions on how to do this). Once you know your exact measurements, you can learn to adapt your patterns for a better fit. Not everyone is a standard size; personally, I have a long torso and long arms, so I usually have to adapt my sweaters longer if I am knitting from a pattern. To illustrate this point: the second sweater I ever knit, I finished completely to the exact specifications of the pattern. Then I tried it on and felt like a giant. Both the arms and sleeves were too short by a long shot! When you know your measurements, you can begin to realize when things won’t fit and can alter them as you’re knitting instead of after you’re finished. 4. It isn’t finished professionally. I think that finishing makes all the difference. In fact, it is now my goal for every sweater I knit to be easily mistaken for something that I could’ve bought from a store. Not that I want my garments to look machine knit, of course...but I do want them to look professional and crisp. Some things to look out for when you are finishing your sweater are using the correct seaming method and bind off, weaving in your ends and blocking your work. The great thing is that in this day and age we can look up just about anything online! Iif there is anything you’re not sure how to do, just take a few minutes to search for a YouTube video or photo tutorial. It is worth the time and effort to finish things properly and will make your sweater look great! 5. You never finished it at all! Another common problem with knitting sweaters is never finishing what we started. Knitting a sweater is a big project, kind of like running a marathon: it's a long race, so you need to pace yourself. Maybe you got busy and forgot about it, maybe you started off too quickly and got burnt out ⅔ of the way through, or maybe you made some mistakes and didn't want to pull back to fix them so you just started another project instead. Whatever your reason, I encourage you to pick it back up again and head for the finish line. One of the ways I motivate myself to finish projects is by setting small attainable goals for myself. When I reach my daily or weekly goal, I stop. If I am knitting a particularly simple sweater sometimes I will get bored, so instead of knitting at home I will work on it while out socializing. Another great way to stay motivated is to actually go work on a similar project at the same time as your friend or knitting group. Then everyone encourages each other and keeps up the excitement, plus it's really fun to see what everyone else comes up with! 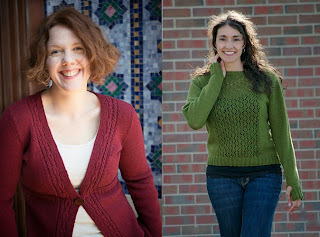 Dalriada by Amy Herzog & Lace Panel Pullover by Marly Bird. If you’d like to learn more about planning your next sweater project and avoiding some of the common sweater mistakes, download our free Sweater Planning Guide. 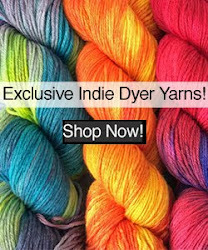 In this guide we talk about yarn choice, getting gauge, how much yarn to buy and everything else that goes into knitting a sweater that you’ll love! This guest post is a part of the 30 Day Sweater Challenge promo tour. Join us this October as we help 5,000 knitters around the world knit a sweater they’ll love in just 30 days. 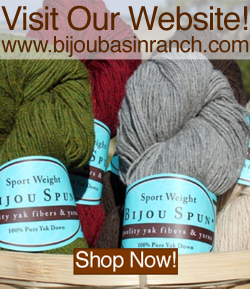 To sign up just visit 30daysweater.com/bijou and download your free Sweater Planning Guide. It will help you get started on the right foot! See you in October!